Episode 55 - As if intending to seal his fate, Duryodhana warms up the Pandavas by sending over an odious gambler Uluka as a messenger to goad them into fighting. Then Bhisma kindly gives us an inventory of the fighters who will take place in the coming battle. There are a bunch of guys who I've never heard of, and do not seem to have any important role to play in the story, so I've left them out, trying to keep the cast of characters under control. As for the rest, they are all rated between Rathas and Atirathas. Finally, Bhisma assures the Kauravas that he could personally beat anyone on the opposing side, except for Arjun, but not to worry about Arjun, because he would never kill his elders or gurus. The others he would not kill: the Pandavas, any women, and anyone who used to be a woman. It turns out, there is one of these trannies on the Pandava side-- it's Drupad's 2nd son, Sikhandin. Next episode, Bhisma will tell us why it is he cannot kill this particular warrior. I'm an Indian and my introduction to the Mahabharat was my grandmum narrating the tales to me as bedtime stories, then there was Amar Chitra Katha which are a comic series of Indian mythologies, the TV series that you keep referring to in your series. My curiosity of the stories and characters kept increasing and I understand them better (or at least so I would like to believe). The epic still fascinates me and I try to pick up as many stories of it as and when I come across them. So, when a friend recommended your podcasts to me for my long drives to work, I admit I was skeptical - a foreign perspective to the great Indian epic was somehow not very appetizing. But I must admit I absolutely love your series. I can't wait for the drives now, so I can listen to them. Traffic jams have also become mildly tolerable :). I was wondering if you plan to do other mythologies (Greek or Norse) or epics (Illiad, Odyssey) in this format. I, for one, would be very interested!!! Also, I think you might find this version of the Mahabharat very interesting http://cid-c44cd1dd55949ef8.skydrive.live.com/self.aspx/.Public/Bhimsen.pdf. Its from the point of view of Bhim and it strips the story of its mythical and magical-ness. It was translated from a Malayalam book by a very good Indian blogger - Prem Panicker. I found it very very interesting and thought it might interest you as well. I must confess that I had never imagined I'd have such a large audience in South Asia. I had reckoned that most of my audience would be people like me, educated westerners with an interest in the ancient literature of India. But at this point, one about two thirds of my downloads take place in India. I'm guessing that the majority of my listeners in the UK, Canada, Australia, are also from India. It's a surprise and an honor that so many Indians would be interested in what I've done. Amazingly, I haven't really offended anyone (or at least that I'm aware of). I guess the real blockheads don't know about podcasting yet! As for the translation of Bhimsen, that's a great find. I've downloaded it on my kindle and I've started reading it. 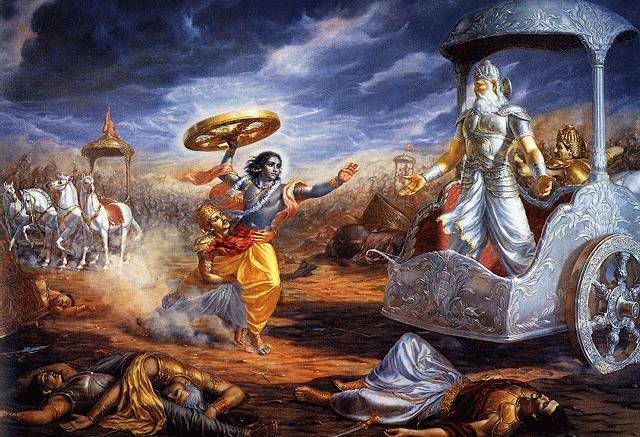 I'm not so interested in the literature the tries to change the story, like make Karna the good guy or portray Krishna as unsure and frightened; it just goes directly against what is described in the epic itself. If you contradict the facts of the story, you undermine basis for your own credibility. If you can't trust Vyasa at his word, then there is no point in even listening to the story! Well, I don't quite agree with you there. A large reason why the story is still alive is because of the oral tradition and the additions and the deletions to the text. I think each one is an interpretation - some are interesting, some not so much. Also, I prefer to not look at it as an epic or literature, but just a story open to interpretation, modifications, etc. Thanks for these amazing podcasts. Being, born a Hindu (in South Africa) I grew up with these stories too, and its really refreshing to hear a westerner's perspective. What really amazes me though, is how the story grows in complexity each time one's hears it. Like the work itself, layers upon layers of interpretation and insight are built upon each subsequent reading of this great story. Like yourself, I'm a purist when it comes to the text and have been pained trying to find a complete set of the epic that does justice to the text. I found Ganguli's translation to be too stilted in its language. Roys translation is too distracting with its Bengali form of the characters' names. So I finally settled on the Gita Press Hindi translation. Excellent, but in Hindi unfortunately. Thanks for the link. That is a great translation. I like the concordance, since sometimes I don't quite know the original word the translator is referring to, such as when van Buitenen refers to Ratha as "Warrior" and Maharatha as "Paladin", you would never guess what he was referring to if you didn't already know! I wish I had that for the entire epic before I started this. But still, it would never do to just read the text as-is for a podcast. The language is overflowing with needless insertions, like the adjectives for everyone that get larded onto each sentence! Aditya; I should clarify what I mean by deviations from the text. What I enjoy, and sometimes do myself, is elaboration on the existing text. I think the Bhimsen book is a good example. The line I will not cross, and do not like elsewhere, is when they change the facts of the epic to try to make a point. The dimension of the story that gives it great depth is the fact that it was written so long ago. I find a deep mystery at the heart of it, and once we start contradicting the original meaning of the text, we instantly drop that dimension, and it becomes a "modern" text. Once it is a modern text, it is now in competition for my attention with Harry Potter and the girl who kicked the hornet's nest! At least you can be assured that I'm not going to tweak the story. I will always stick to the facts, to the best of my ability to interpret them!